Did You Know? 80% of the animals and plants found in Australia are unique to this continent and cannot be found anywhere else in the world. Southern Australia, including Queensland, Victoria, Tasmania, and surrounding islands are home to some of the most venomous snakes in the world, including Notechis scutatus. Eastern tiger snakes reside in various temperate habitats, including river banks, creeks, swamps, and moist forests. They can be found in moist or dry, rocky areas as well. This organism can commonly be found slithering around on the ground, but they also have the ability to climb small trees and rocks in order to capture prey as well. Eastern tiger snakes are diurnal, meaning that they are active during the daytime, rather than at night. When the weather becomes warm though, they become active throughout the night. During the colder temperatures, Notechis scutatus take shelter within the crevices of rocks, hollow logs, or tunnels and holes dug into the ground. Studies have shown that even though juvenile eastern tiger snakes were able to choose what habitat they wanted to reside in while being tested, a majority picked the habitat type they had been raised in. Also these test individual snakes operated most efficiently in the environments they were born into, in comparison to other habitats. Still searching for more? Click here to get a better idea of how N.scutatus survive the colder temperatures. Image obtained from the Clinical Toxinology Resources website. Throughout Australia, there is a wide range of species that can be found occupying the same habitats as the eastern tiger snake. In particular, Australia is home to more than 378 mammal species, 828 bird species, 4000 fish species, 300 lizard species, 140 snake species, 2 crocodile species, and approximately 50 types of marine mammals. Since N. scutatus occupy such a wide array of habitats and areas, they share their home with many different species. In order to survive in this environment, Notechis scutatus have taken many adaptive measures. By using their darker-color banding pattern or skin coloration, they are able to absorb the sun's heat at a quicker rate to help control their internal body temperature. The quick rise in body temperature allows them to be active, especially during days where clouds are dominant. 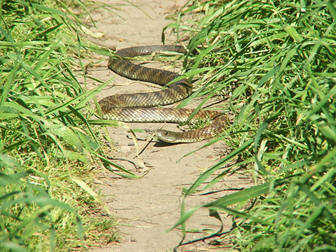 Eastern tiger snakes are also capable of efficient movement within both terrestrial and aquatic environments. By possessing this characteristic, they are able to move/reside throughout a wide range of areas/habitats and consume many different organisms in the process. Want more information regarding the specific organisms found throughout Australia? Head to the Australian Museum website! Now that we know where Notechis scutatus can be found, let's see how this species has adapted to its environment. To head back to the home page, click here.